The AU200-100 x 100 XY Open Aperture Stage is designed for applications such as laser drilling, machining, medical, industrial, testing, scanning, alignment, assembly and optical applications. The stages’ table comes in 300 mm x 300 mm size whereas the aperture measures 188 mm x 188 mm size. The unit delivers resolution of 20 microns per each axis with a repeatability of 2 microns and position accuracy of 2 microns. It is offered with recessed mounting and precision pattern of drilled and threaded mounting holes. New High Precision, Low Profile XY Open Aperture Stage Features 1 Micron Resolution and 2 Micron Repeatability! Van Nuys, CA – OES (Optimal-Engineering Systems, Inc.) has added a new, high precision open aperture stage to it's expanding line of precision XY stages. 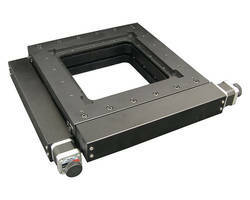 The AU200-100x100 stage is a low profile stage measuring just 80 mm (3.150 in.) high with a compact footprint (including the motors) of 348 mm x 348 mm (13.701 in. x 13.701 in.) The linear travel of the X and Y axes is 100mm x 100mm (3.937 in. x 3.937 in. ), and the resolution of each axis is 20 microns (non-micro-step) or 1 micron (20 micro-steps per step motor driver in use), repeatability is 2 microns, and the positional accuracy is 3 microns. The stages have preloaded V-groove and crossed roller bearings and ground 4 mm per-turn lead screws having just 2 microns of backlash, all contributing to the high precision and stiffness of the AU200-100x100 Stage. Designed for applications such as: Laser drilling, machining, medical, industrial, semiconductor handling, testing, scanning, alignment, assembly, and optical applications, this compact, low profile black anodized aluminum XY stage is easy to integrate into new or existing systems. The XY stage's table measures 300 mm x 300 mm (11.811 in x 11.811 in.) and the open aperture measures 188 mm x 188 mm (7.402 in. x 7.402 in.). A recessed mounting and precision pattern of drilled and threaded mounting holes facilitate the alignment of tooling or fixtures. Additionally, solid tooling plates are available for custom and interchangeable applications. The standard two-phase (1.8o) stepper motors have knobs for manual adjustments of each axis of the stage, however, the knobs can be replaced with incremental encoders for position verification. As an option, servo motors and compatible motion controllers are also available from OES, or the AU200-100x100 Stage can be ordered as a complete plug-and-play motion control system. Some of the industries OES serves are: Aerospace, Astronomy, Chemical, Communications, Educational Institutes, University, Colleges, Government Agencies, National Labs, Manufacturing, Medical, Metrology, Military, Motion Control, Museum, News Agencies, Semiconductor and Test Equipment. Optimal Engineering Systems, Inc's. competitive advantage is its state-of-the-art in-house manufacturing facility in North America enabling OES to supply clients with custom designed orders or high volume just-in-time deliveries globally. Van Nuys, CA 91406; Telephone: 888-777-1826 or +1 818-222-9200, or E-Mail: sales@oesincorp.com or visit the Web site at: http://www.oesincorp.com.